Donkeys: the new wave of commercialism! Back in 2003, mankind did a disservice unto itself with the creation of "The Annoying Thing". It was a harmless little three-dimensional being with bulging eyes, blue-tinged skin, and eerily protruding tiny genitalia. Once an overbearing corporation grabbed the rights for the character, that's when the world began to crumble. They decided to mass-market the character alongside irritating music. But the world would not know "The Annoying Thing". They would henceforth know this bing-bonging monstrosity as Crazy Frog. The earth's gentle crust shattered as its irritating voice shone loud and proud over the airwaves, and its initial success spawned three mega-cheesy dance albums. Every song has a creepy high-pitched female-like (yes, I say "female-like" because it's sometimes borderline androgynous) voice that wouldn't for a second evoke an image of a donkey. You know it's just a guy with an extended tufted beer belly croaking into an old microphone plus a sound engineer pitching it up. The Pretty Intro is strange enough: storytelling about a pretty little donkey girl whose dreams can only come true via angelic interference while a fine rendition of "The Entertainer" plays in the background. Okay, it eventually morphs into a terrible hip-hop mockery, but seriously, what IS all this nonsense? According to the tale, the fourth angel gave her a big summer hit with Dolly Song, about the only track from this album you'd ever be likely to hear outside of, well, this album. It's a cover of "Ievan Polkka", a Finnish polka from the 1930s (perhaps also notably seen as an Internet meme, played while an anime girl twirls a green onion). 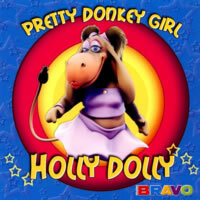 But this version is sped up and the donkey girl sings her little heart out over a standard dance beat. Is it cheesy? Yes. Is it even the slightest bit infectious? ...Well, maybe just a little bit. But you KNOW it's a corny song while listening. Next is Slap & Tickle. Aside from being a euphemism for some tawdry behaviour behind closed curtains, it's also another cover. But of what, you ask? I'm sad to report that it's the Cantina Song from the bar in Star Wars, interspersed with Holly Dolly suggesting that they have a little "slap and tickle" in their car instead of dancing. This is extremely peculiar, especially given the fact that it's a DONKEY in a purple dress. The next song, Limbo Rock, is another cover of, well, the song of the same name. It's the one all your friends in Hawaiian shirts sing when limbo's played at a party, just with a happy jenny voice. At this point, I determined that the only demographic they could possibly target with this album is very young children. Or perhaps the deaf, because nobody else could possibly find enjoyment with this cheesefest. Lollipop is next. Oh, wait, let me elaborate. "Lollipop, lollipop, oh, lolly lolly lolly..." You know the song. But have you ever heard it sung by a female donkey? I doubt it! I just noticed that every song has background vocals featuring someone with a somewhat deeper voice going "boong-bong-bung-boong" ad nauseum. That counts as music on a technical note. Next is La Isla Bonita, a cover of Madonna's 1987 single of the same name. Coated with standard island rhythms and marimbas (and those "boong-bong-bungs" that plague every track), it feels like a heartless version of the original. Then again, Holly Dolly is just a heartless creation by a multinational corporation, so I shouldn't expect more. Without Control is, admittedly, a funky electro-house song whose origin I can't actually trace. Is it original? Dare I believe my ears? Holly Dolly apparently wants us to shake our behinds and enjoy some rock and roll while a semi-groovy "boong-bong-bung" voice leads the bassline. It's not great, but it'll at least get swarms of happy ladies flapping their arms in the air on a random plastic dancefloor. Plus it seems legitimately original to me, which gains the album a titch of credibility. Not much, but a titch. Of course, it all becomes lost when a remake of Don't Worry, Be Happy hits your speakers. Oh dear sweet Georgia Brown, no. Bobby McFerrin must be spinning in his— wait, he's still alive? Okay, he's probably just moderately annoyed. I also didn't think things could get worse, but a dance version of Old MacDonald Had A Farm could actually make that a reality. But Holly Dolly wouldn't possibly do that. ...But alas! Holly's Farm makes it happen. Is nothing sacred? Doesn't it seem ironic that a farm animal owns a farm now? Then Holly takes on the children's Halloween dance genre with Horror Show. It's based heavily off "In the Hall of the Mountain King", an orchestral piece by Edvard Grieg. (I recognized it a bit more as the theme song from Inspector Gadget.) The song is actually among the most generic on the album, a feat that is quite difficult to pull off. If I must, then let's tread onward with the uncleverly named Holly Samba, a take on Bellini's "Samba De Janeiro", a staple in pretty much any Dance Dance Revolution fanatic's audio collection. Just add a few "boong-bong-bung" sounds in the background and you've got the makings of a real Holly Dolly hit, if only that were possible. Next up is Mister Joe. Yup, it's a cheesy version of "Cotton-Eye Joe" by Rednex, and that song was already pretty cornball in its own right. Holly Dolly doesn't even hide this because although the song is called Mister Joe, she still calls him "Cotton-Eye Joe". And Ciao Ciao Goodbye rounds out the package with a downtempo song about the different ways to say goodbye. I can't find a source for this song, so I'm going to make the dangerous assumption that it's also original. It's not terrible, but that silly "boong-bong-bung" vocal clip I've been mentioning in the entire review is really taking its toll on taking any of these tracks seriously. But wait! Holly Dolly isn't finished yet! She has two holiday tunes up her donkey sleeve with Santa Baby and Jingle Bell Rock. The former is played like a jazzy and classy number, suitable for a dark smoke-filled moonshine-huffed club. The latter is more uptempo and As Christmas favourites, they're no more blasphemous than any other versions you've probably heard on the radio. ...Wait, what?! iTunes is charging upward of $18.99 for this album, depending on the version you buy. Seriously. Quit while you're ahead, Dolly. Then again, this really is your only option for purchasing the album. Can you seriously picture yourself entering a store and buying this in a public space? Didn't think so.